Advancing in any strategy modality requires gaining a bird’s-eye view seeing beyond ad hoc moves to cohesive patterns. Market-shaping’s rich variety of moves share common principles about timing and win-win-win outcomes. Timing your move to proven signs of shapeability makes the difference between striking while the iron is hot and repeatedly striking your head against a brick wall. Moreover, every pitch should specify, and ideally quantify – in the right language and in good faith – likely wins to those actors you need to move with you. Likewise, every shaper will repeatedly profit from a handful of generic go-to combinations. · The first principle is to time your market-shaping efforts to periods of relative shapeability or “malleability”. Although a process of educated trial and error, three phenomena typically signal malleability: any shock or sudden change, whether natural, regulatory or technological; dissonance and debate; and/or a recent history of deliberate shaping by a firm or government. · First mover advantage is surprisingly rare in market shaping. Prerequisites of such first mover advantage are: major network effects, customer lock-in, and flexible enough core technology and business model to adapt when the market inevitably changes further. · While markets are less shapeable, “wait actively”: perfect your readiness, build a war chest, and reserve the right to play by lowest-cost, least-committing investments. · Market shaping takes time: typically years. · The second principle is win-win-win. You must demonstrate credible, specific, quantifiable wins to all players in the minimum viable system needed to achieve your market vision. Hold your nose and collaborate with rivals to shape the market, but compete to share it afterwards in order to avoid improper collusion. Even giants often lack sufficient market-shaping power acting alone. Not collaborating risks painting yourself into a corner as dominant players in mere niche. And markets with few providers and much regulation simply cannot be shaped alone. 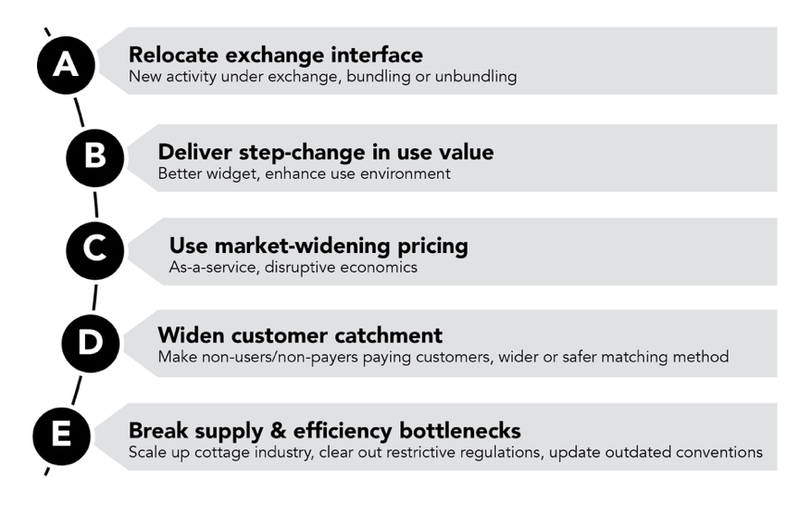 · Five generic multi-move market shaping plays and variations on them should feature in every shaper’s repertoire: (1) relocating the exchange interface, either by monetizing a non-monetized activity and insourcing it from the customer, or by bundling and unbundling; (2) delivering a step-change in use value, either by commercializing a new, markedly netter widget (or indeed simply a better mousetrap as long as it is massively better), or by enhancing the users’ knowhow or improving their infrastructure, (3) widening the market to more frequent consumption by more customers via pricing, either through as-a-service pricing that lowers capital expenditure or aligns incentives, or by disruptively slashing prices and costs; (4) widening customer catchment area – either by turning non-payers or non-customers into paying customers, or by wider or safer matching methods; and (5) breaking system-level bottlenecks by scaling up cottage industries, clearing our regulatory bottlenecks to supply and demand, or modernizing social norms to improve system efficiency.